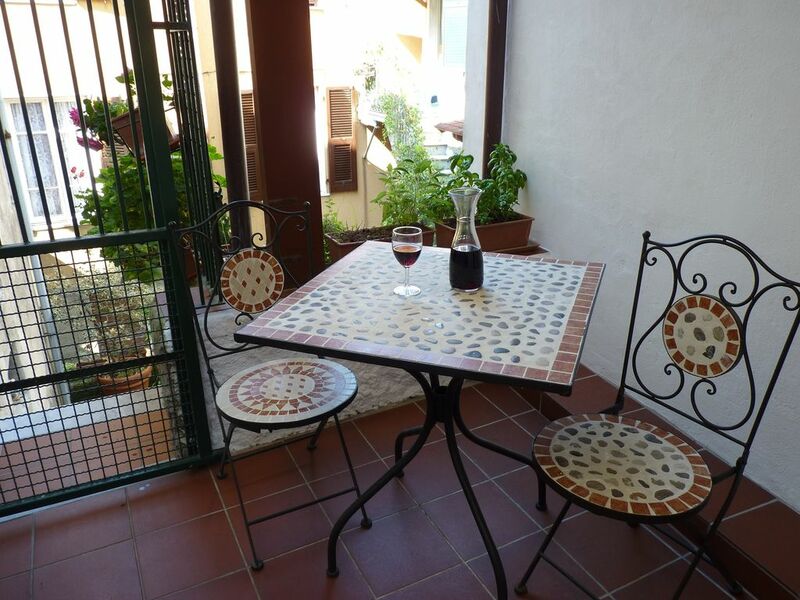 Our house is open on three sides and is located in 'centro storico', the old town centre. The front opens up to a vestibule, and the back opens up to a small garden that is bordered by an olive grove. The room with the washing machine, the wood and the garden furniture is located on the ground floor with its arches. There is a fully-equipped kitchen, living room with large dining table and a balcony on the first floor, there is an adjoining room with couch and television. There are also 2 bedrooms and 2 bathrooms with WCs. There are 2 more bedrooms and the large roof terrace on the top floor, from here you have a great view - all the way to the ocean on a clear day. The thick, old stone walls help maintain a comfortable temperature, the gas central heating system provides warmth during the cooler seasons and the wood stove in the living room provides additional comfort. Our family of four SO enjoyed Susanne's home. The villa was well stocked with everything we needed. We ate dinners out on the roof-top deck while enjoying the gorgeous views of the valley below. The location is a bit out of the way for walking access to restaurants, etc, so a car is necessary but it was easy for us to visit Lucca, Cinque Terre as well as Florence. The home was spotlessly clean, comfortable and spacious. Susanne was terrific to work with and responded quickly. We loved our stay! Wir hatten einen wunderschönen Aufenthalt und die Nachbarschaft war sehr gastfreundlich! Die Schlüsselübergabe funktionierte super! Es gab genug Informationsmaterial für die nähere Umgebung! Die Betten waren sehr bequem und sauber! Wir hatten während unseres Aufenthaltes schwere Gewitter und dadurch fiel der Putz von den Wänden! Dieser feine Staub legte sich auf die gesamte Kleidung und auf die Betten. Die Küche ist etwas in die Jahre gekommen und die Dunstabzugshaube und der Backofen waren sehr schmutzig und dadurch nicht zu benutzen. Sonst hat es uns allen sehr gefallen und wir konnten uns sehr gut erholen! Dejlig bolig med atmosfære og godt forsynet med køkkenting m.m. Skønt område med kort afstand til bl.a. La Spezia og Cinque Terre (som også kan nåes med tog eller færge. )Man kan endda komme til huset med offentlig transport, hvis ikke man har mod på de mange hårnålesving i bil - bussen stopper lige om hjørnet. Vi var 7 personer i huset, og der var plads nok til alle. Abbiamo soggiornato nel Casale in occasione del Capodanno. Luogo davvero suggestivo...nelle giornate di pioggia si era praticamente avvolti dalle nuvole! La casa è risultata confortevole, dopo un giorno e mezzo anche ben riscaldata (avevamo bimbi piccoli..il che era importante!). La casa è fornita di tutto il necessario: biancheria, pentolame, stoviglie. In caso di necessità siamo stati prontamente aiutati da chi gestisce la casa. Montebello is part of the Bolano community and is made up of three districts, that are located between olive groves and the vineyards on the sunny south west hillside. Montebello di Cima is on a high point and has a beautiful view over the valley down to the ocean. It is the ideal starting point for trips to beaches, to the picturesque Cinque Terre, the famous coastal towns of the Riviera di Levante (e.g. Portofino) or to the south of Tuscany (Pisa, Florence). The Ligurian high altitude hiking trail begins right above Montebello. You can hike through chestnut forests and over open spaces with surprising view, take day tours or hike via Genua to Ventimiglia on the French border. There are some recommendable restaurants nearby. In the 'Boschetto' you can eat great - the owner cooks - and the guest pays little, the 'Fortino' offers mainly fish dishes.